For Travel and tourism industry, customer acquisition is the key to success. With number of price comparison platforms, there’s high competitive pressure and price transparency. With the use of beacon technology in travel and tourism industry, companies can outstand competition with the help of its hyper-local and contextual capabilities. Mobile apps connected with location-based technologies can be fruitful to increase sales and bind customers. Beacon technology proves to be one of the best platforms to provide enhanced customer-experience right from the check-in and airport navigation to the collection of baggage at the arrival. It may happen that, guests’ missed out some important announcements or are unable to check out some relevant notices which can result in confusion or they may even miss their flight. But, what if guests receive notifications on their mobile phones? If beacons are deployed at an airport, guest can immediately know the updates about the gate change and due to indoor navigation feature; the beacon can provide access to the map, guiding them to the right location of the gate. Moreover, with the help of beacon, airlines can increase their sales by offering discounts on upgrades to business class, etc. Hence, placing beacon near security checks can help generate additional revenue for the airlines. Ancillary sales are a much important source of revenue in the aviation industry. It generates revenues from online operations such as baggage, onboard food and services etc. But, they do need actionable strategies to offer a desirable combination of personalized ancillaries. Deploying beacons can help in enhancing the overall customer experience. If passengers have the app installed, they can get essential information about the flight status when the guest is in close proximity of the beacon. Moreover, with beacon and the respective app installed, airlines can give day pass to get access to lounge area, seat upgrades on long-haul flights, priority check-in etc. For instance: Miami International Airport provides an app that can help the guests to direct the passengers to the correct gate at the airport, while also notifying about nearby shops and restaurants. Chhatrapati Shivaji International Airport in Mumbai, deployed beacons at the airport to simplify passenger experience and came up with an app that includes a number of features. By downloading its mobile app, the passengers can opt-in to receive push notifications about their flight. Passengers are provided with information on shopping outlets, restaurants as well as other facilities as they walk through the terminal. Deploying beacons in hotels provide a new way to connect with your guest personally, while also delivering personalized messages during their stay. Beacon technology enables hotels to identify their guests via an app, for instance, a receptionist can see the guest profile on a smart device, when the guest enters the hotel. Right from the time the guest checks-in at the hotel, till they check-out, the hotel can send them different type of push notification about the amenities available. Hotel can help the guests navigate through the hotel with the help of indoor maps. For instance: Starwood Hotels and Resorts have deployed beacons in their properties. They enable guests to unlock their rooms using a digital key on their smart phones. These features can reduce waiting time and cut-off phone calls, while delivering smooth and comfortable stay. Apart from airports and hotels, beacon technology, can help discover tourist attraction in a city. With the help of a beacon app, tourists can get various information about the nearby place such as its history, weather updates, transportation schedules, shopping options, restaurants, etc. The app should support multiple languages in order to cater to tourists of different ethnicity. 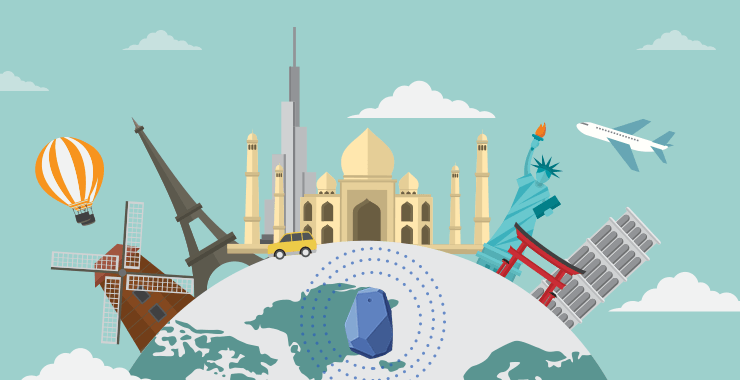 From travel and accommodation to museums and retail outlets, beacons are revolutionizing every aspects of travel and tourism industry. With mobile devices gaining its popularity, beacon technology is becoming one of the best ways to communicate directly with the customers and providing enhanced customer experience. Applications of beacon technology help in closing the information gaps between airlines or hotels and guests while keeping them digitally connected with more cohesive customer experience. Businesses that wish to provide rich features can use beacon technology to scale up. More information on how to deploy beacon technology, get in touch with our expert consultants.